Canards, or tail-first airplanes, were popular back in the 1970s. That was the era of the VariEze and the Long-EZ homebuilt fiberglass and foam airplanes from Burt Rutan, which fostered great interest in the modeling community. 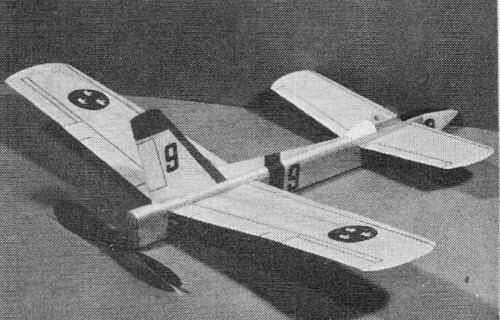 Many of the world's jet fighters were adopting the canard configuration as well. Hiram Maxim, inventor of the Maxim machine gun and father of the American Radio Relay League's (ARRL) founder Hiram Percy Maxim, experimented with a canard aircraft design in the late 1890s. Much aerodynamic information has been learned about the canard over the last century and the concept is no longer a matter of great curiosity, but looking up into the sky and seeing an airplane 'flying backwards' till cause most people to do a double-take and wonder about what they are witnessing. Be the first on your block to fly backwards. Complete plan on back of centerfold. 2 sheets 1/16 x 3 x 36"
1 strip 1/16 x 1 x 20"
1 strip 1/4 x 3 x 20"
1 sheet 1/8 x 3 x 4"
Tailup free flight canard pusher. 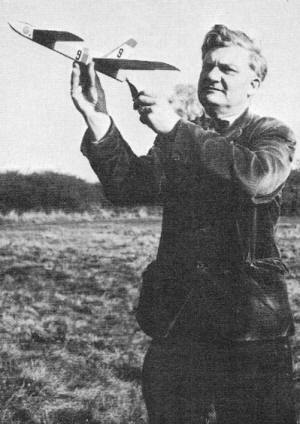 Author demonstrates launching technique. Plane must have adequate airspeed before release, no prop wash over surfaces. 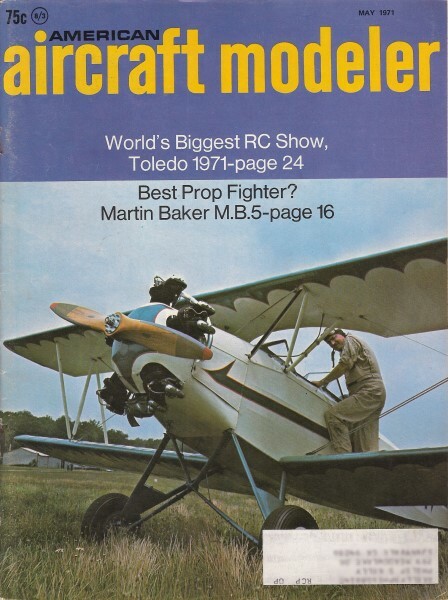 Those who built the fascinating little Tail First (a canard-type model in the November 1969 AAM) will need no urging to get going on this follow-on model with its easy sheet construction and modern fighter-like appearance. 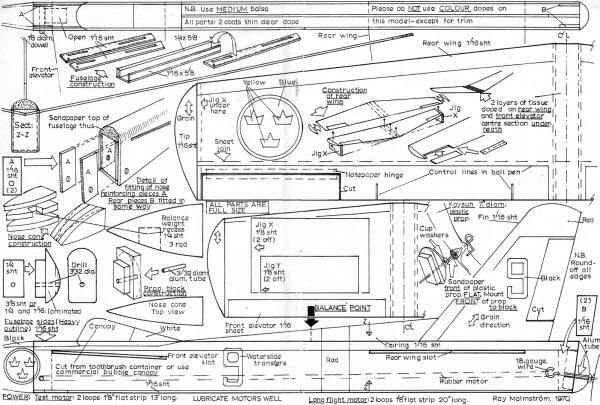 Trace the fuselage side and transfer it to 1/16" sheet balsa. Cut out two sides, making sure the front elevator and wing slots are lined up accurately. 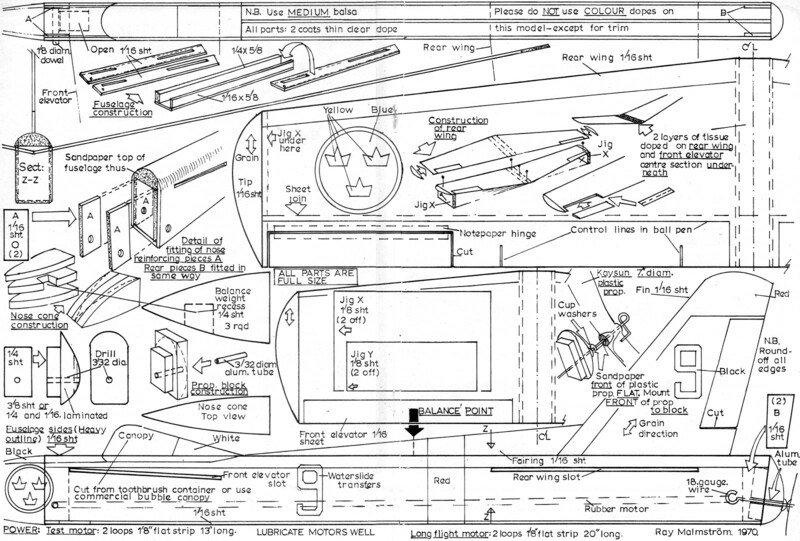 Cut a length of 1/4" and one of 1/16" balsa for the top and bottom of the fuselage and build this assembly (see sketches), adding reinforcing .pieces A and B. Carve and sand the fuselage top, and round off the bottom edges to the section shown. Push a length of 1/8" dia. dowel rod through the hole at the front of the fuselage. Make the nose cone from three pieces of 1/4" sheet and cement it to the front of the fuselage. Fair the nose cone into the fuselage shape with fine grain sandpaper. Then give the fuselage two coats of clear thin dope. Construct the propeller block from a piece of 1/4" sheet cemented to two thicknesses of 1/16" sheet. Accurately drill a 3/32" dia. hole and insert a short length of 3/32" outside dia. aluminum tubing. Insert the propeller block in to the fuselage rear and sand it to shape. Take a 7" dia. Kaysun plastic prop or a small Sleek Streak prop and sand or file the center flat. Bend a loop in a piece of 18-gauge wire and push the wire shaft through the prop. Since this is a pusher model, the prop must go on with the front of the prop facing the propeller block. Slip two washers or beads on the shaft and insert it through the prop block (see sketch). Then form the hook for the rubber motor with small pliers, and the prop assembly is complete. Give the block two or three coats of dope and put a tiny drop of lubricating oil on the shaft. Check prop for absolutely free revolving. Cut the fin from 1/16" sheet, noting the grain direction, as well as the small cut near the bottom. The fin fairing piece also is cut from 1/16" sheet. Pin all sheet surfaces down to a board and dope one side at a time. Pinning avoids warps. Give these parts two coats of thin clear dope, lightly sanding between coats. The canopy can be a commercial bubble type or, as we used, the end from a plastic toothbrush container. The wing is cut from 1/16" sheet (joining is needed with the usual 3" wide sheet). With a knife or razor blade, score, but do not cut through, the centerline on the underside of the wing. Crack along the scored line and tilt the wing panels upward. Run cement into the crack and pin the wing to the building board while the tips rest on the dihedral jigs(x). Wax paper under the joint will prevent the wing from sticking to the board. Elevators are fitted as shown in the wing construction sketches. Round off all edges with sandpaper and give the wings two coats of dope, following the same procedure as for the fin. Two layers of tissue doped over the center of the wing on the underside reinforce the center section. Repeat this method for front elevator, using dihedral jigs (y). Ballpoint pen lines can be drawn on the wing and elevator, and the insignia (ours is that of the Swedish Royal Air Force) can be painted directly on the model, or painted on thin paper, cut out and glued in position. Wing and front elevator are then slipped through their respective slots, checked by viewing from the front for equal dihedral and firmly cemented in place. Make up the test motor (see plan), lubricate with rubber lube, and install it in the model. Balancing is important. Many beginners, and old hands too, so often neglect this all-important item before flight testing. Suspend the model from a thread tied to a pin which is pushed into the balance point shown on the plan (black arrow). Put a little weight (sheet lead or folded empty cement tube) into the recess provided in the nose cone until the model hangs level. The ship should not hang with one wing down (front view). If it does, add a tiny spot of plasticine or modeling clay to the top of the lighter wing. Choose a calm day for flying and test over long grass. Without winding the motor, launch the model into the breeze, from shoulder height, with a smooth follow-through movement of the arm. Never throw the model. It should glide down straight ahead and land about 15 to 20 yd. away. To get a really shallow glide, bend the elevators on the wing tips up a wee bit (about 1/16"). Correct a sharp turn in either direction by gently warping the rear part of the fin in the direction opposite to the turn. Now it is ready for a power flight. Wind the propeller in a counterclockwise direction and put on about 200 to 250 turns. The model should climb away gently from a smooth follow-through launch, cruise a short distance and glide in to a smooth landing. If the model dives, put a piece of 1/16" sq. balsa strip between the bottom of the prop block and the fuselage, or bend the elevators up a little more. If the model stalls (climbs steeply, falls backwards, and then nosedives) put a piece of 1/16" sq. balsa strip between the top of the prop block and the fuselage. When the model is making short but steady flights, install the larger motor, which will take about 700 turns on run-in lubricated rubber.